In Every Pair Of Pictures Tell A Story, I said I needed more information on what was happening with the new Wales and Borders franchise. This article on the International Railway Journal is entitled £800m fleet renewal plan for new Welsh franchise, gives a lot more serious information. These two paragraphs outline the plans. According to the Welsh government, around £800m will be invested in rolling stock to ensure that by 2023, 95% of journeys will be made on a new fleet of 148 trains. The average age of the fleet will drop from 25 years to seven years by 2024. More than half of the new trains will be assembled in Wales, indicating a major order will be placed with CAF, which is currently building a new assembly plant near Newport. The article then goes on to make specific points. Class 769 trains will be used as a stop-gap measure until the arrival of new bi-mode trains. Five of these trains are on order for delivery in the next eighteen months. Class 230 trains will join the fleet. Perhaps they will be used on the Conwy Valley Line. The line is rather isolated from depots at Cardiff, Chester and Machynlleth, which would find the Class 230 trains remote servicing capabilities useful. The Wikipedia entry for KeolisAmey Wales states that the Class 230 trains will work the Borderlands Line, which will have a two trains per hour (tph) frequency. As the journey takes an hour each way with a round trip possible in two hours, I suspect that a two tph frequency will need four trains, with perhaps a fifth one ready to step into service. Again the remote servicing capability of the Class 230 train will come into play, as will the train’s affordability. Several Class 170 trains will join the fleet. These could be coming from Greater Anglia, who currently have twelve of the trains, that will be replaced by Class 755 trains. This page on the Welsh Government web site, contains this sentence. If you want to find out more about train services in Mid and South-West Wales, the page is well-worth a read. Mark 4 Carriages released from the East Coast Main Line will replace the current Mark 3 Carriages. The article makes these two points. Pacers will be withdrawn by the end of 2019. Class 150, Class 153, Class 158 and Class 175 trains will be completely replaced by 2023. The only ones worth keeping could be the Class 158 trains, most of which if fitted with wi-fi would be acceptable on many routes. The article says that new diesel multiple units will be introduced on these routes. This page on the Welsh Government web site, also says a new Swansea to Manchester service will be introduced from 2024. In Every Pair Of Pictures Tell A Story, I suggested that Class 755 trains could be used on these routes. They have similar performance to the Class 175 trains. Length and power can be tailored for each route. Greater Anglia have ordered two sizes. As they are bi-modes, they could take advantage of the electrification East of Cardiff and around Birmingham and Manchester. But the biggest thing in favour of Class 755 trains, is that the thirty-eight units for Greater Anglia are scheduled to be completed by the end of 2019. So if the Welsh trains are virtually identical to those for Greater Anglia, there would not be any serious certification problems. The Wikipedia entry for KeolisAmey Wales indicates that these trains could be diesel versions of the CAF Civity. The IRJ article says that £738 million will be invested in this project. The Wikipedia entry for KeolisAmey Wales gives a few more details of train frequencies. This is an increase in frequency. It appears there will be two distinct sections of this network, which I’ll discuss in the next two sub-sections. The IRJ article says this. A new fleet of low-floor vehicles offering level boarding will be introduced on the network by December 2022. I think we can assume this about the vehicles. They will be able to use 750 VDC and 25 KVAC electrification. There will be a proportion of street running in Cardiff. It would also be highly likely, that these vehicles will be built by CAF, in their new Newport factory. Wikipedia mentions a tram-train version of their Urbos trams, which are used in Edinburgh and the Midlands, which is called an Urbos TT. A new fleet of Stadler “tri-mode” (electric/diesel/battery) multiple units will maintain links from Penarth, Barry and Bridgend to stations north of Cardiff Central. These trains will enter service from December 2023. It looks from the pictures that these will be a version of the Class 755 trains. In From Novara To Aosta, I described the route, where similar Stadler trains will be used on the Chivasso-Ivrea-Aosta railway to reach the town of Aosta. I would suspect that the Italian route could be more challenging, than anything South Wales has to offer. It would appear from Wikipedia, that the stations at the heads of the valleys will have the following frequencies. 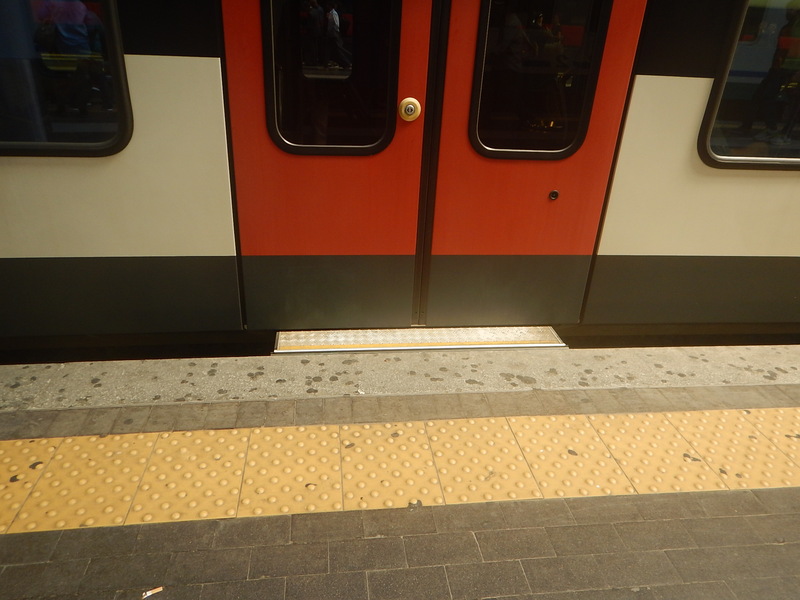 These frequencies and some single-platform terminal stations, will mean that careful design must be applied, so that all vehicles have level access from platform to vehicle. This picture shows the access to a Stadler Flirt in Italy. Note the gap filler, which automatically moves into place. I’m sure engineers and designers working for KeolisAmey, CAF and Stadler can come up with a very good solution. Will The Valley Lines Be Electrified With 25 KVAC? I think it is highly likely that CAF’s vehicles for the tram section of the South Wales Metro will be tram-trains with a dual 750 VDC/25 KVAC capability and batteries. Imagine one of these vehicles climbing to say Aberdare using the Merthyr Line, which is a mixture of single and double-track to Cardiff. Going up to Aberdare, due to the gradients, the vehicles will need access to electrical power, so electrification is necessary, unless each vehicle has a massive diesel generator or ultra-large battery, which are respectively not very environmentally friendly or practical. But I doubt it will matter if the electrification is 750 VDC or 25 KVAC. Going down the valley to Cardiff, I believe that CAF’s vehicles will use Newtons friend; gravity and regenerative braking to control the speed. The energy generated by the braking would be stored in an onboard battery. CAF have all the technology and it would be extremely energy efficient. The Stadler tri-modes would have to use diesel on the way up, but given they have batteries, I suspect they’d come down in a similar way to the CAF tram-trains. So what voltage should be used? The CAF tram-trains will probably be able to use either voltage. If batteries are used to handle regenerative braking, this works with all voltages. The Stadler tri-modes will probably need 25 KVAC. Electrifying with 25 KVAC would allow the Stadler tri-modes to avoid a lot of running on diesel. Any electric locomotives hauling freight would need 25 KVAC. I wouldn’t be surprised to see the valley lines electrified with 25 KVAC. Will Only The Uphill Tracks Be Electrified? I believe that if trains coming down the valleys use batteries for regenerative braking and restarting at stations, it may be possible to only electrify a single-track, that is always used for uphill trains. But only the tracks for uphill trains were electrified, this would make the works easier and reduce costs and disruption to passengers. It looks like KeolisAmey have got a well thought-out plan!